We're Steph & Tony, a married writer & photographer duo who have been living our dreams & traveling the world since August 2012. This site is a bit like a scrapbook documenting our journey and the adventures along the way, but it's also a creative space where we can explore the art of storytelling through words and photos. Though we tend to focus on travel, the real goal is simply to create and share content that informs, inspires, and expands hearts and minds. Thanks for visiting & being a part of the adventure! England France Italy Portugal soon! Enter your email address to subscribe to Twenty Years Hence and receive email notifications whenever new content is posted. IMPORTANT! This email service will only alert you to new posts and will never be used to shill products or send ads your way. It should go without saying, but I’ll say it anyway: we will never sell your information to anyone and will fully respect your privacy! Everyone thinks that the hardest part about planning a long-term trip is choosing the places you will visit. While honing in on just one slice of the world can certainly be challenging, harder still is figuring out how much time to spend in each place. Veteran travelers will tell you not to stress out about those details, that you can’t know how much time a place warrants until you get there and see how you take to it, but even in Asia, costs can vary dramatically from country to country, and if you want to spend a month in Japan, that is going to be a lot tougher on your savings than the same amount of time spent… well, just about anywhere else. Though we freely admit that plans can and will change once you’re on the road (boy do they ever! ), it’s still a good idea to have a rough idea of how long you’ll stay in each country. Traveling as a Canadian and an American, we are lucky that many global destinations either require no visa in order us to visit them, or offer (free) visas upon arrival. Although some of the lengths of stays that result are far greater than we would ever plan on using (90 days in Japan would likely have depleted our entire savings! ), in certain cases, the free visas you receive are greatly inferior to the one you would be issued if you applied prior to arriving in your destination. Take the Philippines, for example: if you apply in advance, you will be granted a visa that allows you to visit the country for up to 59 days. However, for citizens of most nations, you also have the option of visiting the Philippines under the auspices of a visa waiver. The benefit here is that this route costs you nothing out of pocket. The downside? You only get 3 weeks! You don’t have to be a math major to know that for most long-term travelers who have an eye on their savings, free will trump “not free” pretty much every time. It certainly did for us, especially as we were feeling a bit gunshy following our time in China. We had no way of knowing whether we would like the Philippines, so it seemed smarter to invest as little money up front as possible and just do as much as we could with three weeks, provided we even liked it there. If not, we’d puddle jump to some other location and be relieved we hadn’t needlessly spent money to authorize an unnecessarily long stay. Our logic was sound, but here’s the thing that we now know that we didn’t then: three weeks is not enough for the Philippines. Not by a long shot. We liked it quite a lot from the minute we stepped of the plane in Manila, and our affection for it only grew with each passing day. Within our first week we knew that we were going to want to stay well beyond 21 days. Thankfully, our penny-pinching did not force us to prematurely depart the country we had fallen for so hard and so fast. It is possible to have a Philippines tourist visa retroactively issued once you are already in the country; it is dated from the day you enter, which effectively gives you an extra 38 days on top of your original 21, meaning you have 59 glorious days to explore the 7000+ islands at your disposal! There are at least as many hammocks as there are islands, and trust us, three weeks is not enough for all of them! Oh, and of course, along with the paperwork, you’ll also have to pay your processing fee. Just when you thought you were getting off easy, you find that your attempt to save some money early on has come back to haunt you, as now you not only have to pay for the cost of the visa, but also a special fee because the visa is being retroactively issued, AND because they do so on the spot (at least in theory), this is considered a rush job, so you pay extra for that too. All told, Tony and I each wound up paying about $70USD to get our visas, which is about double what we would have paid if we had applied in advance. It certainly stung paying that extra money, but when the alternative was leaving a place we felt we were only just getting to know and already loved, the decision was a no-brainer for us. We want you to profit from our mistake (though, in a less literal way than the government of the Philippines did): when you are planning your trip to the Philippines, unless your vacation time is limited from the very outset, do yourself a favor and get the 59-day visa in advance. You may save yourself some money by limiting your trip to just 21 days, but for the money you save, you’ll lose out on so very much… and you may very well find yourself scrambling to rectify your oversight. Because 3 weeks in the Philippines, is just not enough. Truthfully, 8 weeks in the Philippines is not enough… but at least it’s a start! In another life, I moved from Toronto, Canada to Nashville, TN to pursue my doctoral degree in Psychology. That chapter of my life is now finished, but I did earn the right to demand you call me Dr. Steph (though I respond just as well to plain old Steph). I am an avid reader whose book collection is rivaled only by my many pairs of cute shoes. I also like to knit, hold impromptu karaoke parties, and try new and unusual foods. Generally not all at the same time. I also really love to learn languages, which may explain why I took 3 years of Latin in highschool. I'm turning over a new leaf, so instead of looking forward, I'm going to work on enjoying the present, so the country I'm most looking forward to is whichever one we're in right now! China Visa Woes, Oh Noes! Required fields are marked with red. Anything you share with us will not be published, traded, sold or otherwise used outside this site in any way, ever. We will not spam you. We moderate comments, so if you haven't posted with us before and your comment doesn't show up right away, we will get to it, no need to post it twice. Thanks for your patience! Name Name is required. You can only use alphanumeric characters (a-z, A-Z). Do you know how far in advance you can obtain a visa? We are hoping to make the Philippines our 3rd destination after Mongolia and South Korea. Is it easy to get visas on the road? With as much research as I’ve done on visas, you’d think I’d be a pro, but it still confuses the hell out of me. You may not need a visa after visiting South Korea as you may be radioactive dust! Pray for peace! I think there is also an embassy in South Korea, so it’s possible you might be able to just get your visa while you’re there. We’ve found by & large that getting visas in Asia is much easier than back home. And of course, if worst comes to worst, you can always do what we did and just swallow the extra cost! As I said, that’s better than having to cut your visit short! Good point. I told my husband last night that he’s now in charge of figuring out visa stuff. I can’t think about it anymore and I haven’t been delegating. Of course he has a more laissez-faire attitude about stuff, so I’ll have to learn how to let go of control now. But that’s a good point. If worse comes to worse, it’s not like we couldn’t enter the country. Thanks!! Thanks for the heads-up. I can see why you made that choice after just arriving from China. Sometimes you just have to buy your way through. You’re lucky you could even do that. We always looked at it as “one day back home or one week in India”. It’s always better for your mental health to look on the bright side and have a short memory. 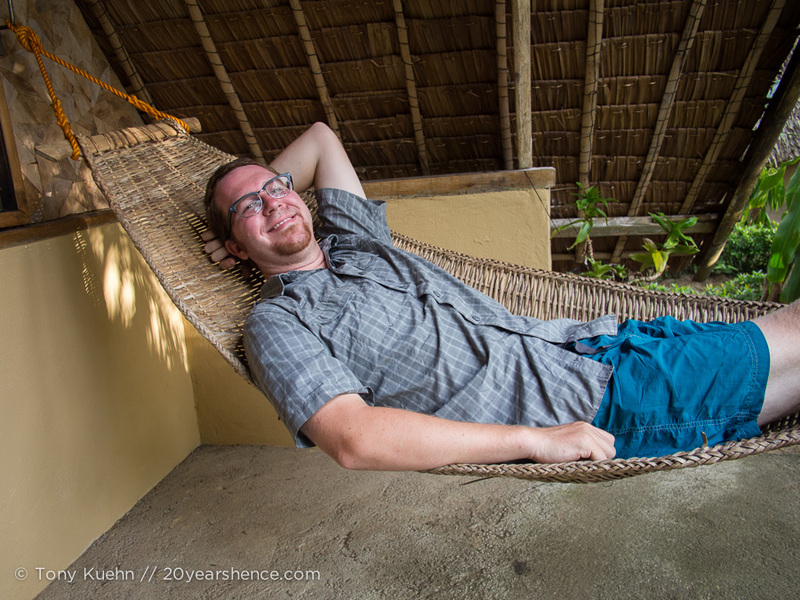 Great post as another: “day in the life of”, I like that hammock shot of Tony. That smile says it all! Yup, in the end, all you can do is make the best decisions you can based on the information you have RIGHT NOW. That doesn’t always mean you make the ultimate right choice, but you did the best you could with what you had, so you can’t beat yourself up for that. But from now on, we know: if it’s cheaper to do so, just get the longest visa you can from the start! We learned that lesson the hard way again here in Vietnam, but I think now we finally know it by heart! Thanks so much for posting this Guys; we were also planning to get the free visa on arrival and possibly extend it but now we’ll think again. Hopefully we’ll be able to apply for a 59-visa at a Philippine embassy in Indonesia; you’re getting us really excited about visiting the Philippines now! I think getting the visa in Indonesia should not be a problem at all, but I expect you to report back! 😀 Worst case scenario, you extend while in the country, but if you are already planning more than 3 weeks there, go ahead and try to get the visa early if you can (you might even be able to get it while you are in Australia!). Some great tips and advice here from your experiences. I’m intrigued about the dress code advice for some visa applications. It seems quite odd since they’ve already allowed you into the country anyway. The Guy recently posted..What Have I Achieved In Six Months? Yeah, I don’t get the dress code thing either especially since everyone in the Philippines is SO laid back. But I guess it’s just that you’re visiting a government building and so they want people to make something of an effort, much like how you shouldn’t show up at temples in daisy dukes and tube tops while in other parts of the world. I suspect that in Manila you might get hassled more for showing up in shorts, but pretty much everywhere else, they’re just happy you’re there and interested in spending more time (and money). Stop getting me so excited for the Philippines! I don’t know when I’ll have the chance to get there anytime soon. It’s been high on my list ever since I met so many lovely Filipinos in UAE. The visa extension is valuable information. Thanks for sharing with us. Hey, thanks for the great advice! I’m currently working with several Filipino teachers at a school in Thailand, and their talk of their homeland has me intrigued. I’ll definitely get my visa ahead of time if I ever get a chance to go! Want a custom website? Need graphic design, marketing or writing? We do all that and more. We built this site, among many others, and would love to help you with whatever it is you need. For more details, visit our Design Services page or our Portfolio. Interested in our travel partners or working with us in some way? We’re willing to consider offers that align with our philosophy and that we think our readers will either benefit from or enjoy. Contact us for more information and we’ll see where a partnership might take us! © 2013 and beyond, Twenty Years Hence. Site design, photography and writing all produced by Twenty Years Hence unless otherwise noted. All rights reserved.